“I’m sorry, but you need to take your dog to see a cancer specialist.” These are words no pet owner wants to hear, but despite their anguish about their beloved dog’s illness, Muneca’s (a name which means “pretty baby doll” in Spanish) family followed the recommendation of their primary care and emergency room veterinarians and brought the little poodle to be examined by the Oncology Service at The Animal Medical Center. This photo shows what a happy dog she was before her illness. Muneca’s story starts with a trip to her primary care veterinarian who, using an x-ray, discovered that fluid was accumulating around her lungs. Shortly after seeing her primary care veterinarian, Muneca’s appetite decreased and she had trouble breathing, so she was brought to the to the ER by her owners. The ER doctors found Muneca had a blue tongue. She was not getting any oxygen into her bloodstream because the fluid surrounding her lungs prevented them from expanding. Carefully, the ER doctors administered a light sedative to allow nearly one liter of bloody fluid to be removed from around the lungs of this 25 pound tan poodle. Immediately she was her old self, but the ER doctors again recommended Muneca be examined by an oncologist. Although cancer is a very common cause of fluid accumulation around the lungs, there are other causes. When I saw Muneca, another x-ray was taken to determine if the fluid had returned since it had been removed by the ER doctors. The fluid had returned, but when Dr. Anthony Fischetti, one of The AMC’s board certified radiologists, reviewed the new films with me, he saw something that intrigued him – bubbles of air trapped within the right middle lung lobe. Immediately he became optimistic that Muneca could be saved! The diagnosis was revised to lung lobe torsion. A lung lobe torsion is a rare disorder seen in dogs, cats and humans. The lung lobe twists around the bronchus, or air tube, and the blood vessels supplying the lung. This traps air and blood in the lung lobe, explaining the bubbles seen on the x-ray and the accumulation of fluid around the lungs. Fluid leaks out of the lung because the blood cannot exit though the twisted vessels. The treatment for a lung lobe torsion is surgery to remove the twisted lung lobe, but this is a major procedure. In Muneca’s case, The AMC provided more than just the diagnostic and surgical expertise. 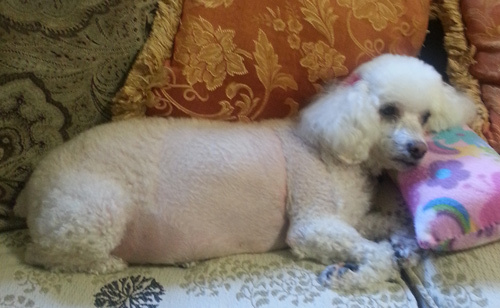 One of our Community Funds, the Patient Assistance Fund, covered the majority of the cost for Muneca’s surgery. Muneca’s surgeon, Dr. Janet Kovak, entered Muneca’s chest on the right side between the third and fourth ribs and removed the right middle lung lobe, which was swollen and adhered to the diaphragm. Muneca recovered rapidly and was discharged from the hospital to her happy and grateful family two days later. In the second photograph, you see her completely recovered and resting at home in her favorite spot. Muneca is just one patient example of why I love working at The AMC – it’s all about the team. Without The AMC team of specialists, that includes board certified radiologists and surgeons, Muneca would not be healthy once again and home with her family and what’s not to like about that!